Reliance Jio and TeamF1 Networks Partner to Offer Fixed Line Digital Services For TV, Telephone, Gaming & Internet! 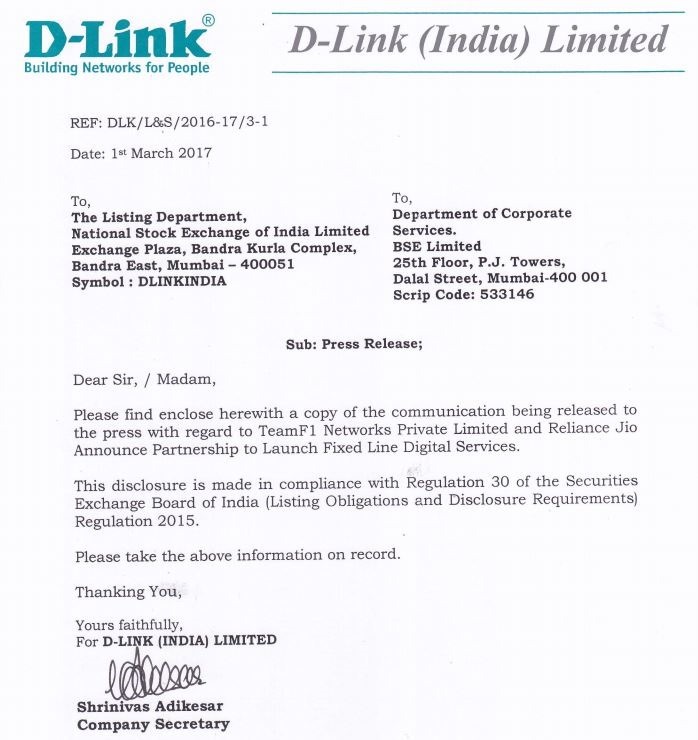 TeamF1 Networks, a subsidiary of D-Link, a global leader in business networking, has partnered with Reliance Jio to offer digital services at home through fixed line network. These services include Media, Television (IPTV, STB), Telephone (VoIP), Gaming and Internet. The partnership has been forged at the Mobile World Congress 2017 in Barcelona, Spain. The companies had been working on tiny things for the last four years, and this is the biggest tie-up so far. This has been made possible through TeamF1’s Home Gateway Solutions (HGW that offers a connection to storage, VoIP phone, personal computer, printer, laptops and mobile phones. It essentially targets to replace the router at home with a smart device that can even help you control lighting, security and other functions at home. Jio will allow TeamF1 to use its world-class 4G LTE network to power HGW and let people get access to fixed-line digital services. The Home Gateway Solution (HGW) is a comprehensive turnkey software package from TeamF1 enabling the next-generation of rich, auto-provisioned residential gateways and CPE routers deployed by Jio. With high-speed delivery of rich content proliferating, provisioned CPE gateways have grown more sophisticated and are no longer just traditional Wi-Fi/NAT/routers. The partnership of Jio and TeamF1 offers HGW with capabilities like media storage/sharing, control of other DLNA and VoIP devices, home automation, security and lighting control. These intelligent HGW devices demand iron-clad security, rock-solid stability, high performance, and smart management of bandwidth through advanced QoS techniques. Imagine having a router placed at home, through Reliance Jio’s network, allowing you to stream videos on your TV, while also allowing you to check up surveillance at home. As these services evolve, you get more ways to track security around you. Since it is a part of Internet of Things, you will be able to communicate with the devices at home, get all the media services and monitor your home with ease. It could be possible through an app but that hasn’t been announced yet. Jio Prime Members to Get 66% More Free Data On Recharge Upto 31st March!